Thanks to those who replied with suggestions as to how best to deal with the threat of demolition of the tower at Maltby Pit. It was great to see that RSPB Senior Investigations Officer officer Mark Thomas picked up the cause and looked into matters today, including a site visit: an impressive response. While prey items were taken to young Peregrines on the tower at Maltby Pit last spring-summer it seems that they were juvs that had fledged from a nest not too far away, at a site not threatened by the planned demolition. Fingers crossed they are successful again – Mark is certainly keeping an eye on them. 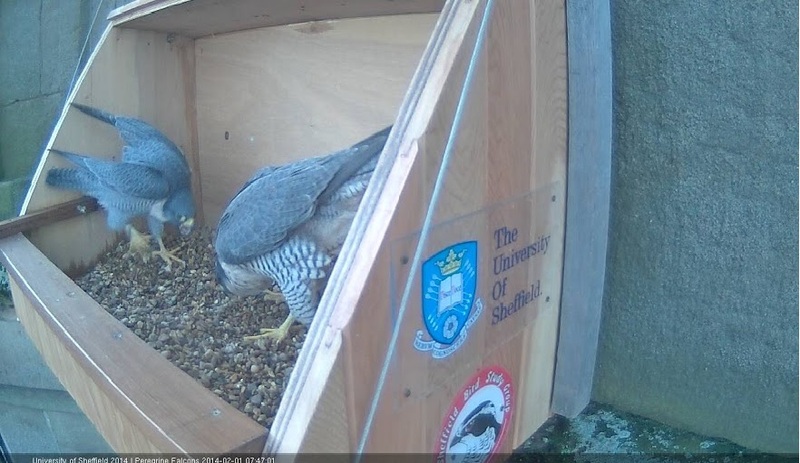 Things are ticking along nicely with the St George’s pair, with both adults regularly tripping the webcam’s sensor and feeding to twitter alerts, as well as being seen with increasing regularity perched elsewhere on the church tower’s stonework. Today saw a development in the female taking a Feral Pigeon to the platform, as above, showing comfort in the surroundings, and she was back later too, as below. I know a few people are frustrated with the angle of the webcam, but there’s nothing to be done about it at this stage, as changing it would entail significant disturbance to the platform. 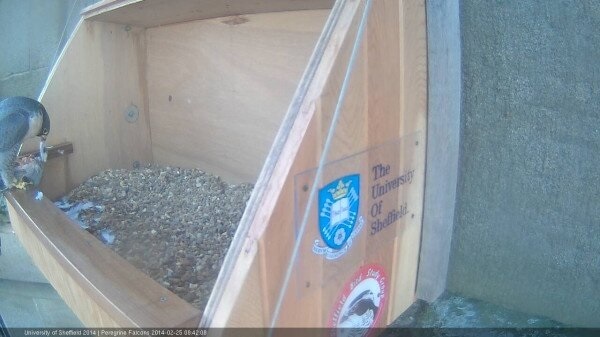 It has also been deemed unpractical to install the hoped-for second webcam. Despite this, we hope the current arrangements will provide some exciting viewing over the months ahead. A phone call received today revealed that not all Peregrines locally are faring so well. John Coopland rang to tell me that a pair at Maltby Pit are in imminent danger of losing what was thought to be their nest site. 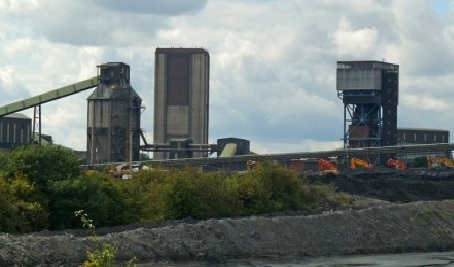 The Pit closed in April 2013, and the buildings associated with the coal mining are being taken down as activity there comes to an end. 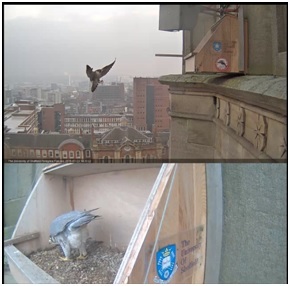 A tower there has provided a ledge that the Peregrines possibly used as a natural nest site last season, and they have returned to the area this year, with activity noted. Unfortunately, the tower is due to be demolished in the coming weeks – exact date unknown. Peregrines are protected as a Schedule 1 species under the 1981 Wildlife and Countryside Act, according to which it is an offense to disturb them at the nest. The nest – and eggs – also enjoy the same legal protection. If anyone has any advice or experience they can share with John as to how he might proceed, please post a comment on the blog here and I’ll put you in e-mail touch with him. UPDATE (7.25pm, 26th Feb) – The RSPB’s Senior Investigations Officer Mark Thomas has replied on this blog post’s comments: “We are meeting various folk on site tomorrow, let’s see what we can do. Had good conclusions from these situations in the past. RSPB will pursue this fully”. 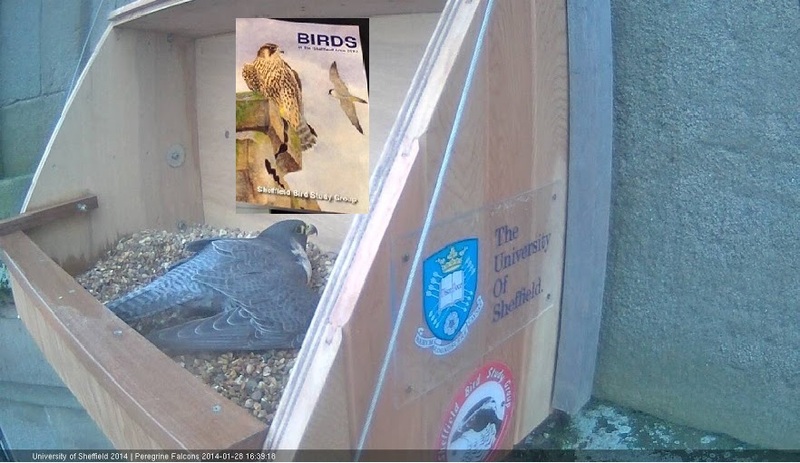 A few developments to report from the last week, most notably the establishment of a sensitive ‘reader’ on the webcam that triggers an alert to the Twitter feed when a bird comes into view. And it’s evident from the amount of ‘Activity alerts’ on the Twitter feed that there’s been a fair amount of activity! Once birds start to be a more regular presence on the platform this will be turned off. Thanks to Ian Knowles for setting this up and for sending me a series of images such as the one below, which shows that both the female and male are using the platform, occasionally at the same time. It’s quite clear to see the difference in size here, with females typically around 15% larger, and again the ring on the male’s right leg is visible. There’s been no sign of mating yet, though that should come soon, and what seems to be taking place here is re-establishing the pair on their nest with a view to a breeding attempt. There have been a few reports from around Sheffield of 3 birds in aerial dispute, so it may be there is another adult bird looking to oust one of the established pair. 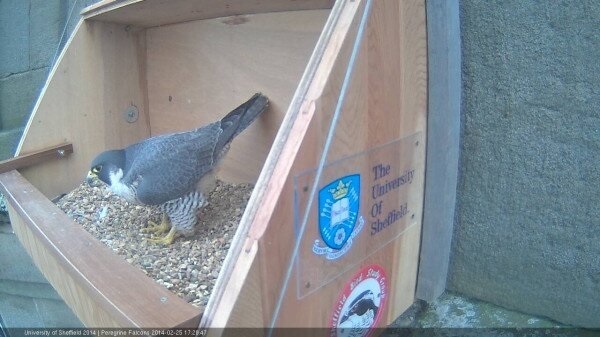 If you would like to know more of the situation of Peregrines in the Sheffield area and beyond the Sheffield Bird Study Group’s 2012 annual report, published in early January, has an article that documents in detail the breeding success of 2012 as well as featuring them on the front cover. 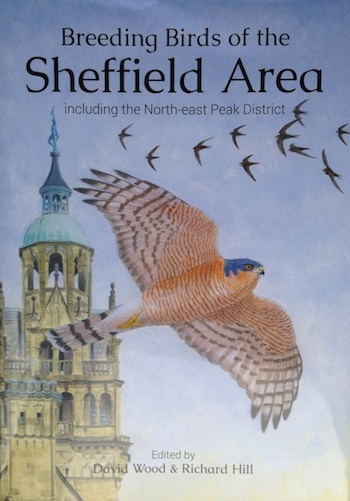 The new atlas ‘Breeding Birds of the Sheffield Area’, also published by the SBSG in January, includes an account for Peregrines and charts their rise in our area since the 1970s. Both of these excellent publications are available via the SBSG website (www.sbsg.org), or can be purchased at SBSG indoor meetings, with details again on the website.